Distemper is an extremely contagious virus. It kills more dogs than any other infectious disease, and it ruins the health of many others. The good news is that it’s almost 100 percent preventable with a vaccination. There’s no good reason a dog should fall victim to this heartrending and painful disease. The virus attacks brain cells, the skin, mucus membranes, and the gastrointestinal tract. 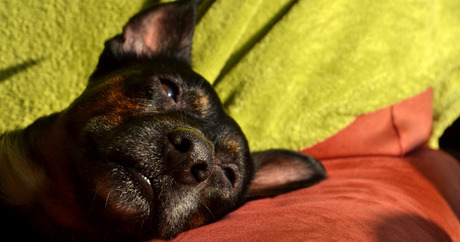 Almost half of infected dogs show only mild symptoms, or even none at all. However, if left untreated for long, the effects can be devastating and lifelong. They include paralysis and impaired smell, hearing, or sight. Infected dogs are also vulnerable to other diseases, such as pneumonia. Dogs with very strong immune systems (there’s no way to tell) may fully recover, but others will worsen and may eventually die from the disease. Puppies are especially vulnerable and are most at risk for death, so it’s doubly important to have them vaccinated. It will be a routine part of a first visit to the vet, if the dog is at least five or six weeks old. Dogs that are infected with canine distemper virus are highly infectious. The virus is present in all body secretions, primarily as airborne particles from breathing, making it easy for an untreated dog to become infected. It appears most often in puppies between six and 12 weeks old who haven’t been vaccinated, since the protective antibodies they received from their mother eventually fall to a level too low to prevent infection. Other dogs aren’t the only threat — distemper is common in the wild, so many raccoons, foxes, and skunks are infected. Coming into contact with the droppings of these animals can easily spread the disease. Initially, symptoms may be mild. As the disease progresses, it attacks the brain, and symptoms become neurological. If you notice any of these, it’s time to take your dog to the vet, no matter what his age. Antibiotics. These aim to prevent a secondary infection. Intravenous fluids. These attempt to address dehydration. Other prescription medicines. These may control diarrhea, vomiting, or seizures. The success of these treatments is largely dependent on the age of the dog, how quickly you seek help, the distemper strain (like the flu, there are different strains, but the vaccine is effective against all of them), and whether your dog has been vaccinated — yes, it’s possible, although rare, for a vaccinated dog to become infected. Some dogs recover on their own, but owners should never take a wait-and-see approach with this disease. However, distemper is similar to the measles: If your dog recovers, he’ll be naturally immune to a second attack, and he’s no longer contagious. No dog should die of distemper. Have your puppy vaccinated; most vets recommend doing so at five or six weeks, or shortly after weaning. (Make sure it’s done before you bring a new puppy home to meet your other dogs.) If you’ve adopted a dog, ask the facility if they give a distemper vaccine — they should. And remember that vaccines provide long-lasting but not permanent immunity. Your dog should receive an annual vaccine to be sure he’s protected.